* Enhance wedding, prom, homecoming or bridesmaids gowns with this dainty necklace and earrings set by Mariell. 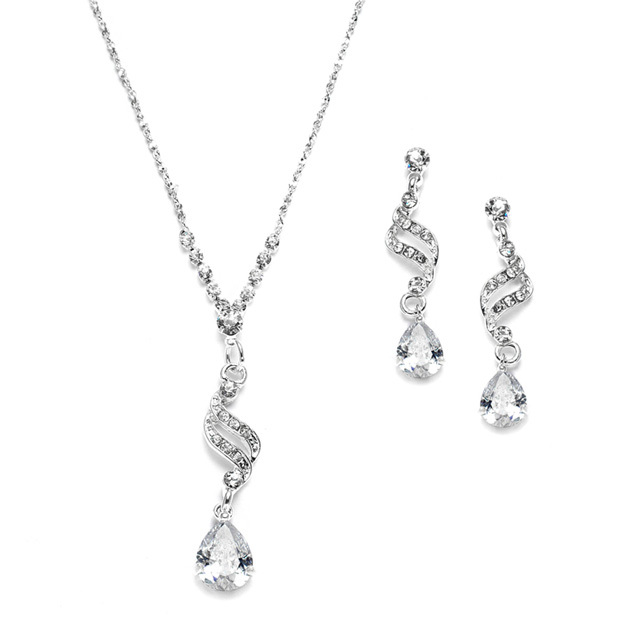 * Our delicate silver plated necklace set beautifully blends Cubic Zirconia teardrops with crystals and rhinestones for a sparkle that will adorn any special occasion. * At an attractive wholesale price, this is a great accessory for any retailer's display. * Mariell's Cubic Zirconia, rhinestone and crystal necklace set will adorn wedding, prom, homecoming or bridesmaids gowns with affordable sparkle & style. * The adjustable 14" - 19" necklace drops 1 3/4" at the center & the chic dangle earrings are 1 3/8" h.